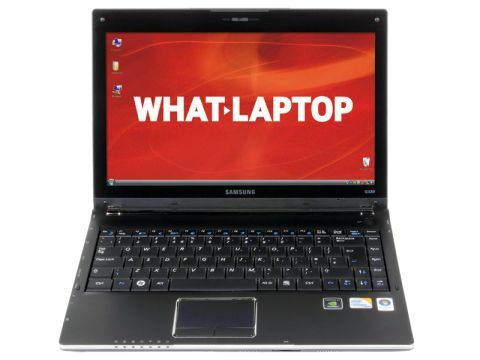 We've long been impressed by Samsung's range of ultraportable and semi-portable laptops, offering excellent mobility, quality and usability at good prices. The Q320 (£699 inc. VAT) is the latest addition – a 13.4-inch machine with a 16:9 widescreen display. The outside of the laptop will be familiar to existing Samsung owners – with glossy plastics that look good, but quickly get covered in fingerprints. Open it up and it's a lot more sophisticated, with a matt-black finish and contrasting chrome highlights. The screen has a glossy coating that stretches to the edges of the machine, giving it a frameless appearance. It's highly reflective and almost impossible to keep clean from fingerprints and other dirt. Colours are vivid, and the 1366 x 768-pixel resolution is sharp, creating more than enough space for viewing a couple of windows simultaneously. It's also great for watching films, as the widescreen ratio keeps intrusive black bars at the top and bottom to a minimum. An Nvidia G105M graphics card helps to give this laptop the best performance we've seen to date from a machine of this size. You'll find enough power for demanding multimedia tasks, and you'll even be able to play games, making it ideal for both home and business users. You'll find one of the most comfortable keyboards you'll get at this size, with large, tapered keys that make it easy to type at speed. They're well attached and move quietly. The touchpad is smaller than some on similar laptops, although it's responsive and easy to use. The 2GHz Intel Core 2 Duo processor and 3072MB of memory give this machine a moderate amount of performance – it multi-tasks smoothly and with little lag, only slowing when running several intensive applications. With a highly impressive battery life of 288 minutes, the Samsung also offers outstanding mobility. The 320GB hard drive will be enough for most people. Despite being a similar size to the Apple MacBook, this is a fully featured machine. You'll find three USB ports for adding peripherals, with Bluetooth included for wireless connections. 802.11n Wi-Fi and Gigabit Ethernet are built in, with VGA and HDMI ports included for connecting to an analogue or digital display. If you're in the market for a highly portable laptop, whether it's for business or home use, we're confident you'll struggle to find a better machine than the Samsung Q320. Comfortable, well made and surprisingly powerful, it comes highly recommended.